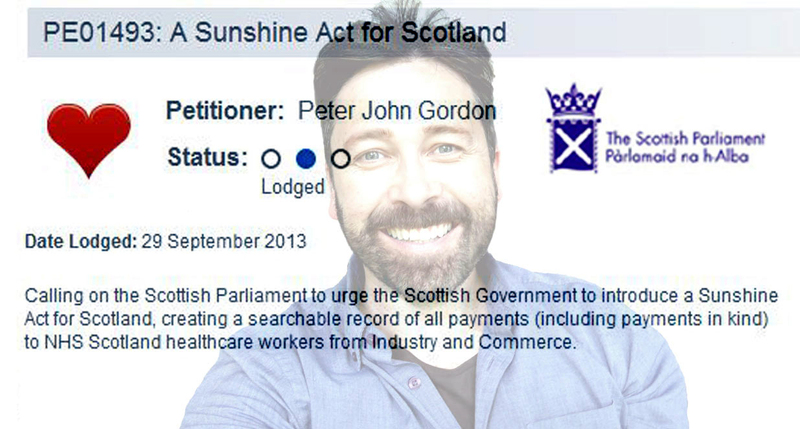 "Over two years ago I raised a petition with the Scottish Parliament to urge the Scottish Government to introduce a Sunshine Act for Scotland. A Sunshine Act would make it mandatory for healthcare workers (and hopefully academics and all allied health professionals) to declare fully any payments including payments in kind. The argument I presented was that a single, searchable, independent register underpinned by statute would ensure transparency, promote scientific integrity, reduce the potential for harm and save money. Current Guidance in Scotland (HDL62 issued by the Scottish Government) has failed for more than 13 years. Other governance bodies, such as the Royal Colleges, have separate systems which also appear to have failed to ensure transparency of financial payments. These overlapping, but ineffective, systems of governance duplicate costs and bureaucracy to nobody’s gain. My petition was closed earlier this month by the Scottish Parliament as the Scottish Government had committed to “update guidance”. The Scottish public want sunshine. The majority of participants felt that the publication of financial payments to healthcare professionals should be made mandatory. This is a landmark decision in the United Kingdom. By the voices of Scotland. Of course there is much more to be done which requires energy and light. The President and Vice President of the Royal College of Psychiatrists (the College I am member of) for doing their very best to improve transparency within the limitations of current guidance." "I recently attended the CME accredited winter meeting of the Scottish Division of the Royal College of Psychiatrists. One of the topics presented was antidepressant prescribing which is rising year on year in Scotland. It is now estimated that 1 in 7 Scots are on antidepressants. The presenters went on to give evidence that prescribing rates are rising because antidepressants are prescribed chronically. The accepted view is that that such prescribing is “appropriate” (1). However, I wonder how many patients who are first started on antidepressants might have been told that they may well end up taking these long-term and perhaps even for life? It would be interesting to know of the experiences and reflections of those who have been taking antidepressants long-term. Perhaps we should also reflect on how such long-term prescribing of antidepressants fits with the now widely adopted “recovery model”? In the recent Royal College meeting I was surprised that the potential harms of antidepressant medication were not mentioned. There was no mention of “discontinuation syndrome” and no mention of potential risks such as suicide (2). What was repeatedly mentioned was concern about public “myths” about antidepressant medication and that as a profession we needed to counter these myths. Interestingly, in a poll of cards, it was estimated, before the presentation, that 3/4s of the audience of Scottish psychiatrists felt antidepressants were overprescribed. The result after the presentation was unchanged. This would suggest that Scottish psychiatrists are not comfortable with such high prescribing rates." Competing interests: Conflict of Interest: I have petitioned the Scottish Government for a Sunshine Act to be introduced: http://www.scottish.parliament.uk/GettingInvolved/Petitions/sunshineact I prescribe antidepressants in my job as a psychiatrist but I try to do so with discussion of the current evidence, where uncertainties are shared and risks and benefits are treated as equally important. People in the United Kingdom are consuming more than four times as many antidepressants as they did two decades ago.1 Despite this, we still do not fully understand the effects of these drugs, nor can we be confident about their risk-benefit ratio. Unresolved problems include the nature and frequency of potential serious adverse effects such as self harming or suicidal actions, suicidal ideation, and aggression. In the linked paper, Sharma and colleagues use clinical study reports to explore such adverse effects.2 Clinical study reports are prepared by pharmaceutical companies for obtaining marketing authorisation. Guidelines on the contents and presentation of clinical study reports exist,3 but requirements are not mandatory. Consequently, although clinical study reports usually contain more data than published articles,4 the level of detail varies. Moreover, what is reported in the body of the clinical study reports may differ from data in appendices, such as individual patient listings of adverse events or narratives of serious adverse events. The analysis of clinical study reports by Sharma and colleagues reveals misrepresentation of adverse events. Comparing the “results” reported in the reports with data from individual patient listings or patient narratives revealed misclassification of deaths in people taking antidepressants and misrepresentation of suicidal events. More than half of the suicide attempts and instances of suicidal ideation were coded as “emotional lability” or “worsening of depression,” for example. Summary reports published on Eli Lilly’s website were even more incomplete, listing only 10% of the suicide attempts revealed in the corresponding clinical study reports, and no instances of suicidal ideation. Over half of the clinical study reports selected by Sharma and colleagues had no individual patient listings, these data having been withheld. This begs the question of how many more adverse events would have been revealed if individual patient listings were available for all trials, and raises concerns about why this information is allowed to be withheld. The current review is consistent with other evidence pointing to an increase in suicidal behaviour and ideation among children and adolescents taking selective serotonin reuptake inhibitors (SSRIs).5 The paper by Sharma and colleagues is the first large scale, quantitative analysis to show an increase in aggressive behaviour in this age group. The analysis did not detect an increase in suicide, suicide attempts, suicidal ideation, or aggression in adults, and meta-analyses of data on adults remain conflicting.6 7 Early case reports, published before the issue became controversial, document occurrence of these effects in adults, however, and provide evidence of the mechanism of these effects. These reports describe a state of agitation, somewhat similar to the akathisia produced by antipsychotics, associated with intense and violent suicidal preoccupation.8 However, as Sharma and colleagues show, recording of “akathisia” in antidepressant trials remains inconsistent and unreliable, hence we have little idea of the frequency of this effect. Although “activation” effects (or akathisia) are recognised, there is little acknowledgment that antidepressants have mind-altering properties that are independent of their supposed effects on underlying mental disorders. One study revealed various changes to emotions and behaviour in patients taking antidepressants that were associated with suicidal ideation.9 Evidence suggests that withdrawal syndromes can be severe and sometimes prolonged.10 With some exceptions,11 however, we lack the detailed exploration through animal behaviour and healthy volunteer studies that might clarify the range, nature, and duration of the alterations that antidepressants induce. With doubts about the efficacy and effectiveness of antidepressants and evidence that they can produce such serious adverse reactions as suicidal and aggressive tendencies, regulators and the public need access to more comprehensive and reliable data. The results reported in clinical study reports, on which decisions about market authorisation are based, are likely to underestimate the extent of drug related harms. We need access to original data from trials, but we also need more research to describe the whole range of antidepressant induced behavioural, emotional, and physical alterations with acute treatment, long term use, and withdrawal. ..."
"Two high profile whistleblowers are teaming up to launch a new campaign next week which will call for more independent regulation of the health service. Dr Jane Hamilton and Rab Wilson, who exposed concerns about the quality of care within NHS Scotland, have joined forces with around 50 other healthcare professionals. A petition supporting their action group will be launched on Wednesday. Their group, Action for a Safe and Accountable People’s NHS in Scotland (ASAP- NHS) wants an independent watchdog set up to oversee the health service and protect staff who speak out on patient safety. It is also calling for better enforcement of existing health and safety legislation and Fatal Accident Inquiry determinations. Dr Hamilton, a consultant perinatal psychiatrist, claims her career in Scotland was ruined after she raised concerns about the Mother and Baby Unit (MBU) at St John's Hospital in Livingston and warned that patients could die. Two women patients subsequently took their own lives at the unit. Former psychiatric nurse Rab Wilson, who exposed a catalogue of errors surrounding the deaths of 20 patients at NHS Ayrshire and Arran, said the lack of independent regulation was a "huge black hole" in Scottish health provision. Dr Hamilton said: "I raised patient safety concerns and followed all the procedures open to me, went to every organisation that should have provided me with help and support, and it was always referred back to the health board, so nothing was ever independently reviewed. "That's why we need more accountability and transparency, the bottom line is that, at the moment, they inspect themselves and what they say goes." Dr Hamilton believes Scotland could follow England's lead where independent regulator the Care Quality Commission (CQC) monitors, inspects and regulates health services. 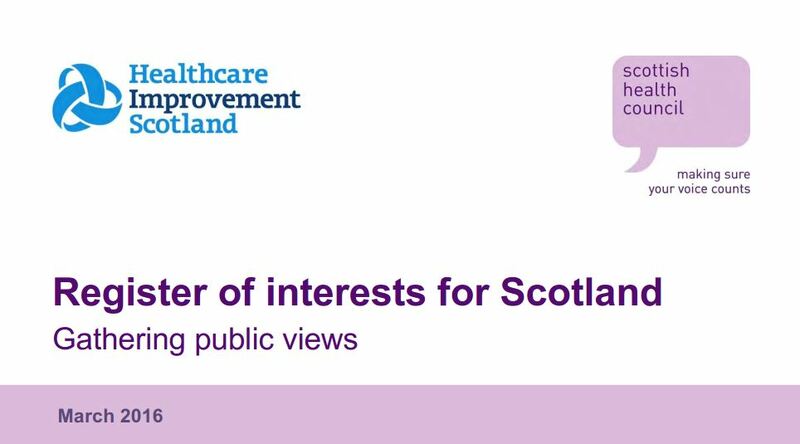 While Scotland has bodies such as Healthcare Improvement Scotland (HIS) and the Scottish Public Services Ombudsman (SPSO), critics claim they are not truly independent and do not have enough teeth. Dr Hamilton added: "There is no independent regulatory body in Scotland, there is nowhere for people to go to raise concerns about patient safety. "That's why several of us have come together to set up this group and take action." After raising her concerns in 2007, the doctor went off sick with stress related illness, then worked elsewhere but was not allowed to return to the unit, officially leaving NHS Lothian last year. The health board and Scottish Government have always insisted her concerns were thoroughly and independently investigated and were unfounded. Mr Wilson added: "The bodies of scrutiny we have in Scotland are just that - bodies of scrutiny. There is no regulation. These health boards can do whatever they like, they're answerable to no-one." He also claimed that recent initiatives such as an anonymous whistleblowing helpline for NHS staff had been "pretty useless". ASAP-NHS will launch officially at the Scottish Parliament building, with a website being set up featuring video clips of patients, families and NHS staff telling stories of their own experiences. Health Secretary Shona Robison said: “The Scottish Government has made absolutely clear to health boards that they must ensure it is safe and acceptable for staff to speak up about any concerns they may have, particularly in relation to patient safety, and with the knowledge that any genuine concern will be treated seriously and investigated properly. “We are also in the process of establishing the role of an Independent National Whistleblowing Officer, to provide an independent and external review on the handling of whistleblowing cases in NHSScotland. “To provide a further level of independent local scrutiny, non-executive Whistleblowing Champions were introduced in each NHSScotland Board in November 2015. This all builds on the measures already in place, including an external confidential alert line, through which staff can raise concerns. 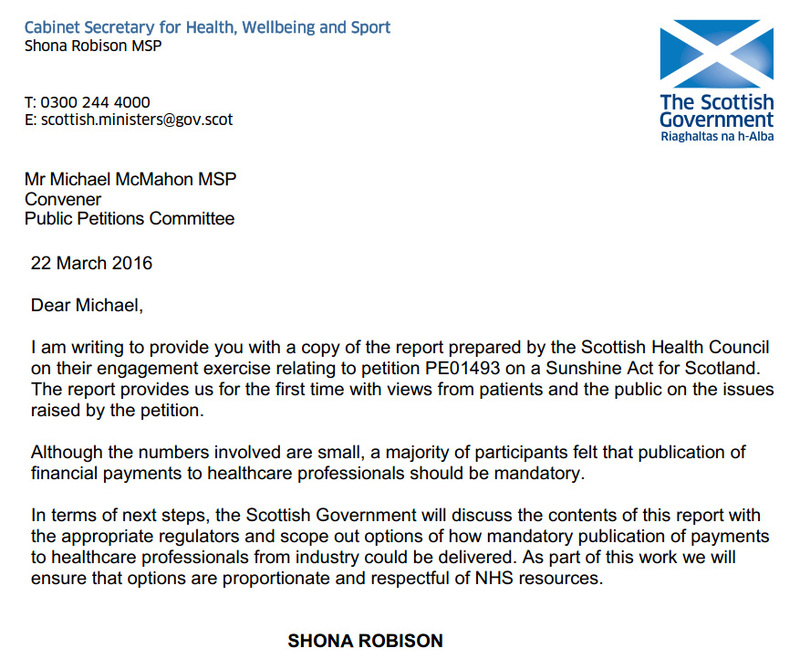 "I have reluctantly decided that I am no longer going to write any posts about NHS Scotland on Hole Ousia. I will however still continue to discuss health and wellbeing in the context of the “two cultures”. My reason is that I no longer feel safe to speak out individually as an employee of NHS Scotland. I will continue to advocate for transparency and accountability. I feel very lucky to be a doctor. The NHS is so important to me. I have so many wonderful colleagues and I never cease to learn from the Scottish folk that I try to help when in a time of need. I will always try my best to put patients first. That is the way I am. I do not agree with those who suggest that such a determination might be considered as a sign of illness. The Friends of Liberty from omphalos on Vimeo. "A pensioner has told of her hell with psychoactive drugs for 40 years which drove her to make repeated suicide attempts while supporting a call for the Scottish Government to review their use. Aberdonian Fiona French has launched a petition calling for ministers to recognise the issue with benzodizepines saying she has lost 40 years of her life to nitrazepam, a drug prescribed for myoclonic epilepsy and given to her for depression. The 61-year-old has made a video detailing her ordeal in the hope that it will persuade the powers-that-be to reconsider how the drugs are prescribed. "Action needs to be taken in Scotland. Little or no action has been taken in the UK over the past 30 years," she says. She says that within two months of being diagnosed the tranquiliser nitrazepam in 1975 she lost a quarter of her body weight and tried to commit suicide. "The next ten years were just absolutely terrible. I couldn't really function," she said. "I spent a great deal of time in bed, or I was an in-patient in hospital or attending day hospitals taking various typed of anti-depressants. I don't know whether they did any good or not. "After ten years of living right that, I tried to commit suicide quite a few times, I came to the conclusion that it was something I would have to live with." After taking retirement in 2012, a new GP suggesting tapering off the nitrazepam - but that led to a two year ordeal which saw her become bedridden through withdrawal symptoms. She said the first six months in coming off the drug "were crazy" and she became sexually aroused all the time. She could not watch TV, read, use a computer or listen to the radio. "I couldn't stand noise, or bright lights, I couldn't do anything I just lay in bed. My nerves were screaming out at me as if they were all in heightened alert. At her worst ebb, she described terrible head pressure, nerve pain and squeezing sensations in her brain. "Sometimes I felt i was having a stroke," she said. No she says she not longer feels depressed and thinks positively. A Scottish Government spokesman insisted it took the issue of addiction to prescribed medicines very seriously, including treatment and support. It added: “In keeping with good clinical practice, clinicians should be providing on-going support and advice to patients prescribed medicines that are known to be addictive or with other long term effects. Where patients are concerned about the effects their medicines are having on their general wellbeing they should discuss this with their GP as soon as possible and alternative treatments that may be available.